I got a little overwhelmed with everything I wanted to do in this big crazy life. So, of course, I did nothing. I freaked out about money and that was about it. I finally got some perspective and went all laser focused on my kitchen. Amazingly, a Saturday of focus and the counters were clear, the dishes were done, the trash was taken out, the refrigerator was empty and the table was cleared off and we could eat together. I learned something sucky. If I slack off for two days in a row, the kitchen goes back to looking like a trash heap again. Rather disheartening to have to do it Every! Day! Like a clockwork routine. 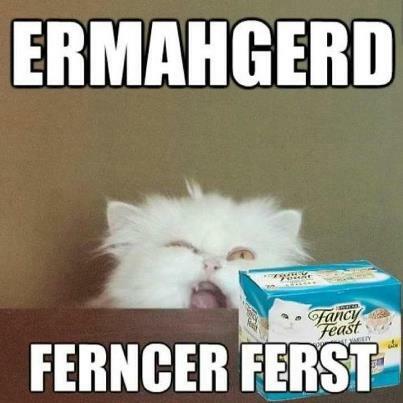 My reaction was about like this, without the delight of Fancy Feast. At least this time, I only had a few days of damage to deal with, instead of long term neglect. I’ve been saving things to reuse or recycle or compost (newspapers, no, I don’t have piles of food sitting around) – I have accepted that right now, that’s not going to happen. Yesterday, the newspapers went in the trash. Today the jars and the plastic will come out of the cabinets, because I’m over it. My kitchen isn’t a landfill, and I need the space for better things. Also to purge? All those recipes pulled from magazines. Years of pages. Those are hitting the trash can today. I’m done with the collecting of things that I might do, I’m gonna try being busy actually doing things. Nice! I have to do that every so often, too. I’m bad about keeping things because I /might/ use them /someday/. It can get really overwhelming! It is so freeing to let go of that you could have done but decided wasn’t that important at the moment. It is a contagious feeling. Enjoy.